Deb Soule began organic gardening and her study of the medicinal qualities of herbs at the young age of 16 and began preparing herbal remedies for her community a few years later. She launched Avena Botanical’s ﬁrst mail order catalog in 1985. When she’s not tending the earth or teaching classes, she is frequently a guest lecturer at conferences and an instructor for botany and horticulture students, garden clubs, and medical students. 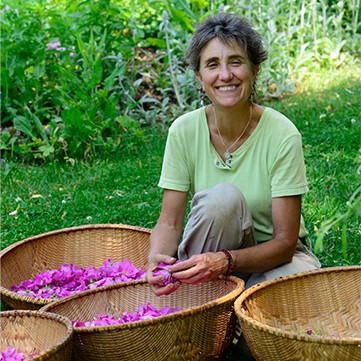 In addition to her work as a farmer and teacher, Deb is the author of The Women’s Handbook of Healing Herbs and the newly released book (with full of color photographs) How To Move Like A Gardener. Her second book includes an introductory chapter on biodynamic gardening. Deb was named one of the 50 most inﬂuential gardeners in the Northeast by People, Places, and Plants magazine.